Take a trip through London's dark and gruesome history, meet Jack the Ripper and see what became of his victims, or see the chaos and destruction caused by the great fire of London. The London Dungeon brings history's most notorious killers and evildoers back to life in an experience definitely not for the faint-hearted. Beware: some of the exhibitions have a nasty way of coming alive and jumping out at the unsuspecting visitor! The tours last about 90 minutes and are very funny as well as scary. The experience can be enjoyed by both Adults and kids. Opening times: Opening times vary throughout the year, check the website for details. 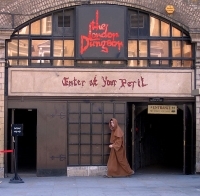 Generally, however, London Dungeon is open from 10am to 5pm every day. Admission: £30 (adults), £24 (children under 15). Concessions and group tickets are available. Discounts for booking online.